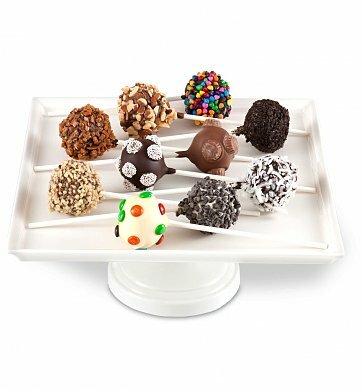 With each one offering a different flavor sensation, this festive collection of ten cake pops is a delicious gift for any special occasion. A favorite choice for indulging someone special - ten times! 10 Cake Pops in Chocolate, Red Velvet, and Vanilla. Dipped in your selection of Belgian white, milk or dark chocolate. Hand-decorated with candies, nuts, sprinkles and more. Each gourmet cake pop is individually wrapped for freshness, and securely placed in a craft gift box. A complimentary card with your personal message is included with your gift. if ordered by 10:00 am EDT Tuesday April 23rd. Belgian Chocolate Dipped Cake Pops is a hand delivered gift. These gifts are delivered by one of our local design centers located throughout the United States and Canada. Same day delivery is available for most gifts when ordered before the cutoff time. The cutoff time for Belgian Chocolate Dipped Cake Pops is 7 AM in the recipient's time zone. Ten fresh-baked tender cake pops, hand-decorated. Three different flavors: chocolate, vanilla, and red velvet. My dear friend was blown away by the gift we sent her. She said they are great and was very happy. I won't hesitate to order from you again. The assorted cupcakes were a graduation present. The first words I heard upon entering the house were "those cupcakes were delicious!" The variety was excellent. We live in a very HOT HUMID climate and I was concerned they would melt. Gift Tree did a good job with packaging and the cupcakes the chocolate had not melted. I would order these cupcakes again!